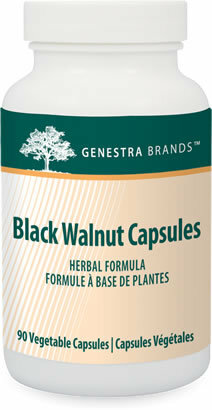 Black Walnut Capsules is a unique combination of synergistic herbs known for their ability to control candidiasis, and parasitic and fungal infections, while soothing the intestinal tract. Chronic overgrowth of opportunistic pathogens crowds out normal intestinal bacteria, deposits toxins, damages mucosal linings and suppresses immunity. Black Walnut Capsules is indicated for bacterial, parasitic and viral infections, including candida, fungus and yeast; for constipation, indigestion, intestinal flu, chronic sinusitis, gingivitis and bleeding gums; and for chronic ear, nose and throat infections.